Choose a fresh peach ice cream recipe from Grandma's recipe collection and make a rich-tasting homemade ice cream that you'll be proud to serve. 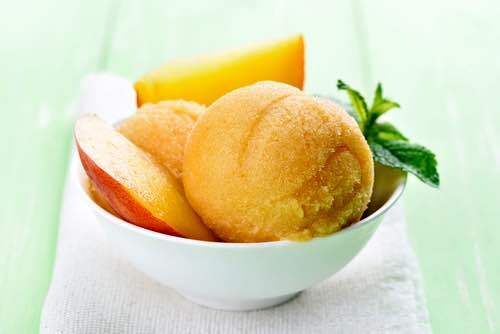 Imagine a melt-in-your-mouth frozen dessert bursting with the flavor of ripe peaches. It's yours to enjoy. 1/2 peck weighs about 7 pounds and holds about 4 quarts of fresh peaches. Pare and cut finely half a peck of very ripe peaches; stir in well two pounds of the best white sugar; let it stand for two or three hours, then stir them well together and put into a preserving kettle to simmer for twenty minutes, stirring all the time to prevent scorching; then pour them into a pan and when quite cold add one quart of cream and one quart of milk; stir them well together; put instantly into the freezer to prevent curdling; this is delicious. Pare and grate a quart of fine-flavoured yellow peaches and mix with a pound of pulverized sugar. Stir gradually into this mixture three pints of rich cream and freeze.